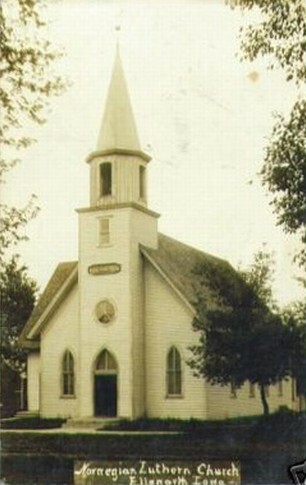 Although this West Trinity Luthern Church building was constructed in 1882, the congregation of this church joined with the Norwegian Lutheran Church of America in 1917, when this picture was taken. 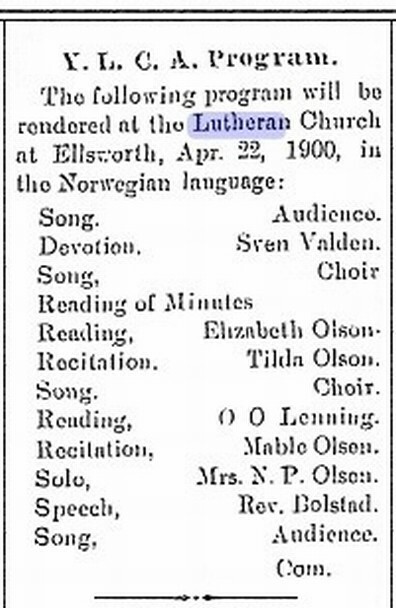 On April 12, 1900, the Ellsworth Chronicle published this program which would be given in the Norwegian language. Lincoln Congregational Church, East Trinity Lutheran Church and West Trinity Lutheran Church are three churches with linked history. In 1890, West Trinity became a member of the United Norwegian Lutheran Church of America and located in Ellsworth, becoming Trinity Lutheran Church. Over the years the church was enlarged and redecorated, the basement being put under the building in 1920. In 1952, the cornerstone was laid for the new structure. See a later view of this church. A movement has been started in Ellsworth for the organization of a troop of Boy Scouts. Last Friday afternoon a meeting was called at the Bennett hardware store, at which time the matter was taken up, and fourteen boys signified their intention of becoming members. Rev. Welch is promoting the idea, and will, in all probability act as scout master when the organization is completed. Another meeting has been called for Friday afternoon of this week, when it is expected that they will have their orders from headquarters and the final steps may be taken in the organization. 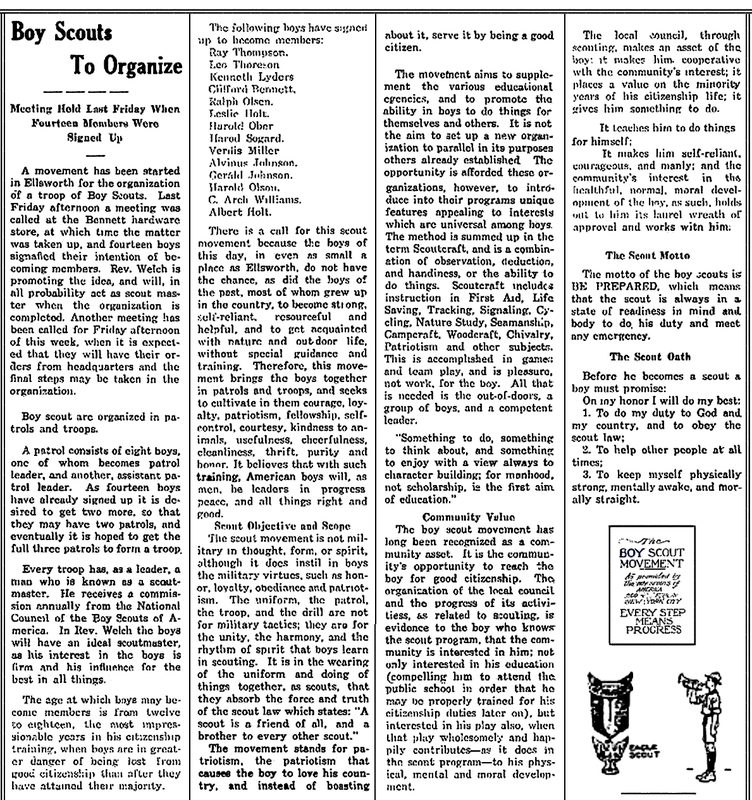 Boy scouts are organized in patrols and troops. A patrol consists of eight boys, one of whom becomes patrol leadr, and another, assistant patrol leader. As fourteen boys have already signed up it is desired to get two more, so that they may have two patrols, and eventually it is hoped to get the full three patrols to form a troop. Every troop has, as a leader, a man who is known as a scoutmaster. He receives a commission annually from the National Council of the Boy Scouts of America. In Rev. Welch, the boys will have an ideal scoutmaster, as his interest in the boys is firm, and his influence for the best in all things. The age at which boys may become members is from twelve to eighteen, the most impressionable years in his citizenship training, when the boys are in greater danger of being lost from good citizenship than after they have attained their majority. 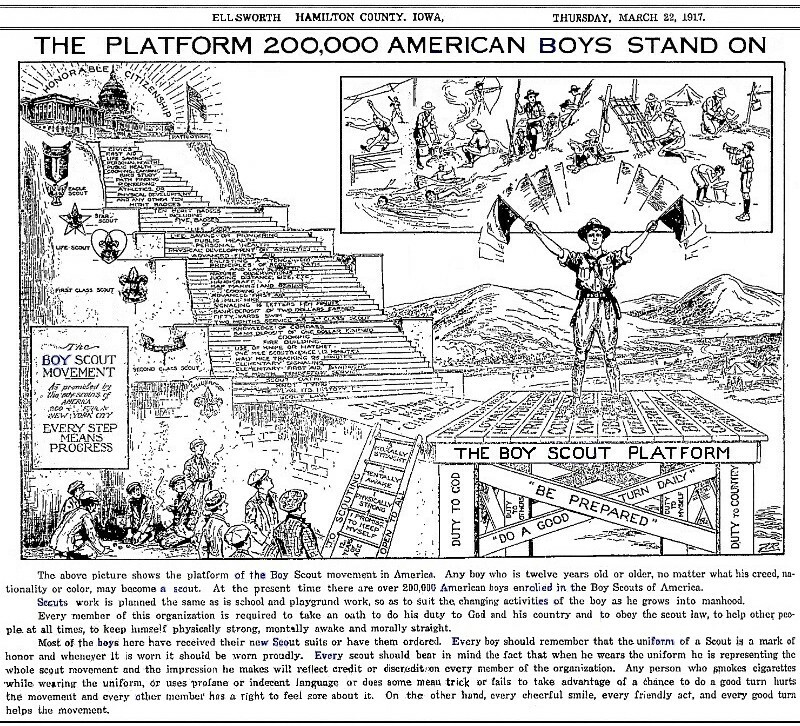 There is a call for this scout movement, because the boys of this day, in even as small a place as Ellsworth, do not have the chance, as did the boys of the past, most of whom grew up in the country, to become strong, self-reliant, resourceful and helpful, and to get acquainted with nature and out-door life, without special guidance and training. Therefore, this movement brings the boys together in patrols and troops, and seeks to cultivate in them courage, loyalty, patriotism, fellowship, self-control, courtesy, kindness to animals, usefulness, cheerfulness, cleanliness, thrift, lpurity and honor. It believes that with such training, American boys will, as men, be leaders in progress, peace, and all things right and good. The scout movement is not military in thought, form, or spirit, although it does instil in boys the military virtues, such as honor, loyalty, obediance and patriotism. The uniform the patrol, the troop, and the drill are not for military tactics; they are for the unity, the harmony, and the rhythm of spirit that boys learn in scouting. It is in the wearing of the uniform and doing of things together, as scouts, that they absorb the force and truth of the scout law which states: "A scout is a friend of all, and a brother to every other scout." The movement stands for patriotism, the patriotism that causes the boy to love his country, and instead of boasting about it, serve it by being a good citizen. The movement aims to supplement the various educational agencies, and to promote the ability in boys to do things for themselves and others. It is not the aim to set up a new organization to parallel in its purposes others already established. The opportunity is afforded these organizations, however, to introduce into thier programs unique features appealing to interests which are univeral among boys. The method is summed up in the term Scoutcraft, and is a combination of observation, deduction, and handiness, or the ability to do things. Scoutcraft includes instruction in First Aid, Life Saving, Tracking, Signaling, Cycling Nature Study, Seamanship, Campcraft, Woodcraft, Chivalry, Patriotism and other subjects. This is accomplished in games and team play, and is pleasure, not work, for the boy. All that is needed is the out-of-doors, a group of boys, and a competent leader. "Something to do, something to think about, and something to enjoy with a view always to character building; for manhood, not scholarship, is the first aim of education." The local council, through scouting, makes an asset of the boy; it makes him cooperative with the community's interest; it places a value on the minority years of his citizenship life; it gies him something to do. It teaches him to do things for himself; it makes him self-reliant, courageous, and manly; and the community's interest in the healthful, normal, moral development of the boy, as such, holds out to him its laurel wreath of approval and works within him. The motto of the Boy Scouts is BE PREPARED, which means that the scout is always in a state of readiness in mind and body to do his duty and meet any emergency. 3. To keep myself physically strong, mentally away, and morally straight. View more articles about Scouting in Ellsworth. 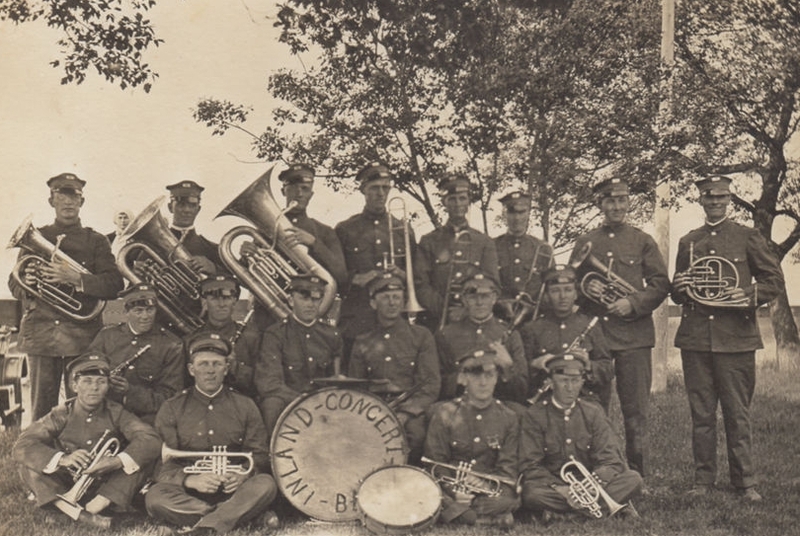 This image came from a postcard mailed in July of 1917. 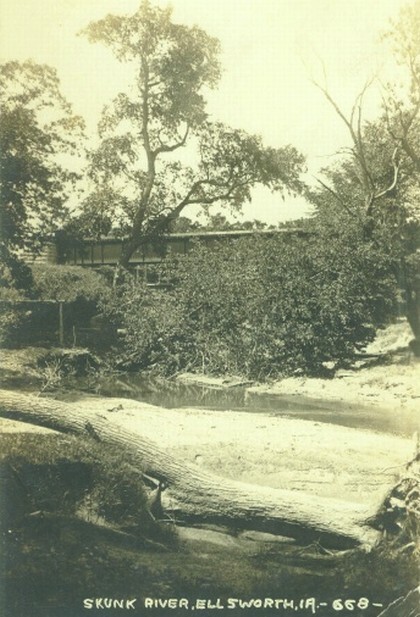 The Skunk River (in a dry season) heads south towards the railroad bridge.